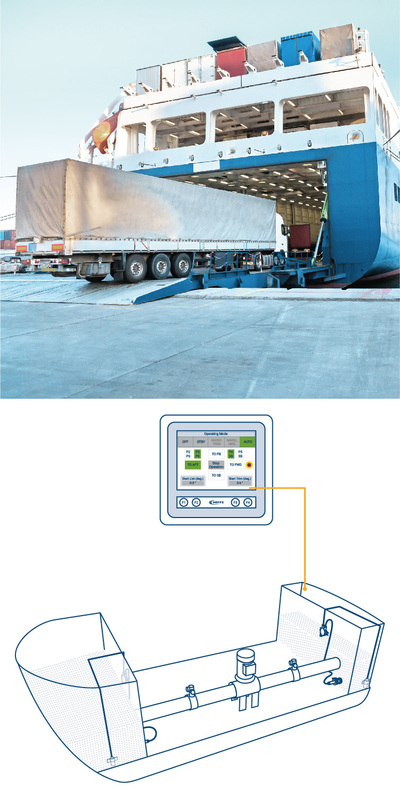 Trim Control systems are designed to keep the trim of a RoRo ferry, a floating dock or any kind of ship within the predefined permissible limits during loading and unloading operations. The correction or adjustment of the arising trim is achieved by generating a counteracting moment through the shift of ballast water within the vessel or exchanging ballast water with the surrounding sea. Typically the system consists of two designated trim tanks, one located in the forward and one in the aft part of the vessel. The water shift or transfer can be realized with centrifugal or reversible propeller pumps and even airblower compressors. The trim condition is determined by two draft measurement units located in the forward and aft part of the ship. The control system offers MANUAL, AUTOMATIC or BALLAST mode operation via HMI – touch screen of PLC unit HOMIP or central PC-Station including connections to IAS/AMS. In AUTOMATIC mode the system starts to compensate the trim angle when the threshold value exceeds ±0.1 meter. The Trim Control system can be combined with Heel or/and Draft Control systems. Then the control software contains adjustable parameters for automatic switch over between the different compensation functions including the automatic selection of suitable tank pairs, pumps or blower units.